There have been many advances in the realm of teleconferencing over the past few years. 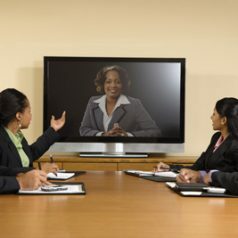 The cost of web conferencing systems has decreased, while the quality of video has made dramatic improvements. While businesses have discovered that teleconferencing can help them save time and money, everyday people are also finding that this technology can help them stay in touch better than ever. While there are many important events that family members would love to attend, distance and scheduling doesn’t always allow people to be there for their loved ones. However, many families have learned that video conferencing is an ideal solution for those who couldn’t otherwise see the weddings, graduations, and other landmark moments in their family. Such communication options have also allowed soldiers who are stationed overseas to remain in contact with families back home, allowing them the opportunity to see their children grow up and celebrate birthdays and other special moments. Nothing beats being there in person, but for some, teleconferencing is the next best thing.